This is another delicacy from Hyderabad. The actual process is really tedious and time consuming where we leave the chicken to cook in a pan. 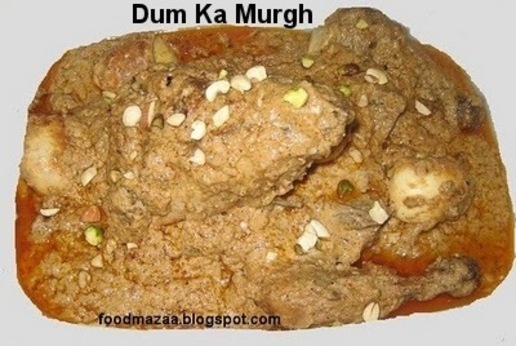 The lid is sealed with dough and the chicken is cooked on a very low flame for few hours...hence the name...DUM KA MURGH. This requires more ghee to avoid burning and it becomes very rich and heavy. So I have simplified it here by roasting the chicken in the oven first and then adding to the prepared masala. 1.Clean the whole chicken and marinate it with 1 tbsp garlic paste, 2 tbsp. yogurt and salt. 3. Fry the whole chicken turning the sides carefully to give it a brownish colour.Cook the chicken in a pre-heated oven for 20 minutes. 4. Now grind the dry masalas and the wet ones seperately. 5. In a pan take the left over ghee and saute the wet masala first for 5-7 minutes.Add the chilli, coriander,cumin, turmeric powders and salt.Now add the second masala and saute further for a few minutes. 6. At this stage tip in the roasted chicken. Using a spoon push a little masala inside the chicken. 7. Add the eggs. Simmer for 4-5 minutes on a low flame. es this dish is really good ...like they say ....MEZ KI SHAAN....my guests liked it a lot. Thanks Sanyukta for the award...thats so sweet of u....Recieving my first award from you...will always cherish it. Thanks Malar..I am glad u liked the prawns as well.This is a recipe I got from a chef when I lived in Lagos. This one looks super good.Thanks for sharing! drooling over the chicken. Very nice recipe. My aunt makes it with whole chicken. I cut it into big pieces. Thanks for sending it to chicken feast. you do make amazing dishes. Love this one!! A dish packed with flavour here. Very nice dinner for your family. Yum!